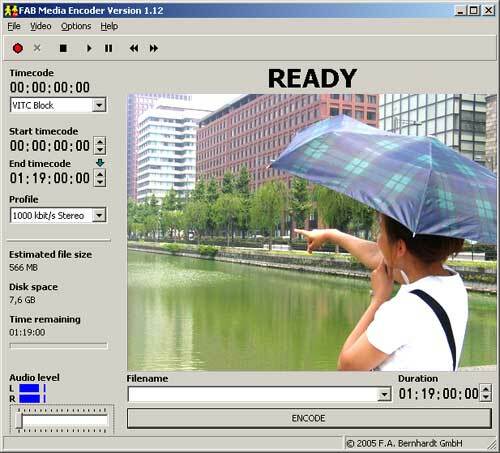 FAB Media Encoder is a system for recording of video, audio and timecode into WMV video files. It is designed as a replacement for the recording VCR in the tape duplication process. The video file can be used for preparation of subtitles. The specialty of the FAB Media Encoder is that timecode is recorded into the WMV video file so that the file can be used for preparation of subtitles. During encoding the cuts (scene changes) are recognized automatically. Scene changes are stored into video files and are displayed during preparation of subtitles. Timecode is encoded into the video file. The encoded video is highly compressed because Windows Media 9 format is used. The Video Codec 1 (VC1) that is used allows bitrates between 200 kbit/s and 3Mbit/s. Because the video files are very small they can be downloaded by translators over DSL. When using the lowest possible bitrate of 200 kbit/s a 90 minutes movie is encoded into a 135MB video file. When using a 2MBit/s DSL line this file can be downloaded in less than 9 minutes. All languages supported by Windows are supported by FAB Subtitler incl. Chinese, Japanese, Korean, Hebrew, Arabic, Cyrillic, Greek and more.